Emotional spending. Has anyone else been there? There was a time in my life when I could find pretty much any reason to go shopping. Most often I shopped as a pick-me-up, when I was feeling bummed out or sad about something. Ironically, my days of shopping as a sport happened to coincide with some of the most broke days of my life. The time in my life when I was worst with money was when I was in grad school and living off my student loans, and I often shopped when I was stressed out or bored. When I think back to those days now, I cringe. These days I am a much more responsible thirty something and wish I could go back in time and waste less money in grad school. Alas, I cannot. All I can do at this point is learn from my past and do better going forward. So what exactly is emotional spending, anyway? Well, emotional spending occurs when we find ourselves spending money because we are bored, sad, unhappy, stressed out, or a myriad of other emotions. It often involves the purchase of items that we may not need (and sometimes don’t even want! ), so “impulse buys” can fall into the category of emotional spending. Sometimes emotional spending can even occur when you are happy! Case in point, a few years ago I was in the grandstand at a horse race track watching the races. On one particular race, a long shot came in first and someone who had placed one of the riskier bets (for those who know racing bets- I think it was either the Trifecta or the Exacta) won several thousand dollars on one race. And within short order everyone in the stands knew exactly who had won it, because he stood up and whooped and yelled to everyone in the grandstand that drinks at the local bar would be on him after the races. That’s emotional spending, folks. I’m sure he didn’t know more than a few people at the races that day, but when he won that bet he let his happiness get the best of him- and he invited the whole grandstand out for drinks. Bye bye winnings. That type of emotional spending is also technically an impulse buy, although horse racing winnings are not typically what we think of when we think of impulse buys! Typically when we think of impulse buys we think of a different place where emotional spending can occur, and that’s at the store while you are shopping for groceries or other goods. Stores use a million different marketing techniques to get you to part with your hard-earned money; upselling is just one example. Some of the most successful marketing techniques often tap into the shopper’s emotions. TV commercials are specifically designed to evoke an emotional response in us- and get us to open up our wallets for x product. 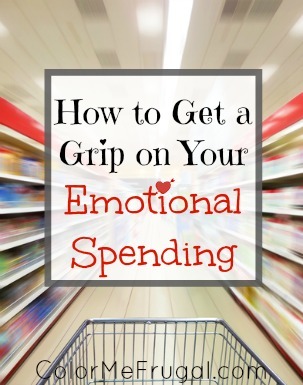 So how can you get a grip on your emotional spending? 1) If you tend to shop when you are upset/bored/stressed/etc, have a plan for those times. Write it down if it’s helpful! I will call a friend/go for a walk/etc when I am feeling _____. 2) Shop with a list. If you make a habit of always taking a list of items you need to the store with you and your habit is to always stick to the list, then it becomes harder to walk out with impulse purchases. 3) Make yourself wait before buying certain items. A good way to do this is to decide that you will always wait 24 hours before purchasing items over $50 (or $100, or whatever limit you would like to place). The idea is that by the time you get home and start to really think about it, you may very well decide that you don’t need the item! If 24 hours later you still think you need the item, odds are good that maybe you really DO need it, and you’ll feel better spending the money know you took the time to think about it. 4) Avoid temptation when you can. For example, if you know that shoe stores are a weakness of yours, why in the world would you go there on payday? Or any day, for that matter, unless of course you have taken the time to think about it (your self-imposed mandatory wait time) and you’ve decided that yes you really do need the item. I also personally mute all television commercials- firstly, because I hate them, and secondly because it bugs me that advertisers have this medium to come into my home and try to sell me things. 5) And avoid temptation some more. Two years ago the hubs and I declared war on junk mail and we’ve made a concerted effort to try to decrease the amount of useless crap that arrives in our mailbox every day. It’s been a huge success for the most part, and a big part of this was that we dramatically decreased the amount of catalogs that come to our home. You know what they say- “out of sight, out of mind.” I really don’t miss catalogs at all, and since I stopped getting them I virtually never order from them anymore. 6) It may help you to confide in a spouse, friend, or family member that you are trying to cut down on your spending/shopping. That way there is someone to cheer you on and also hold you accountable if you mess up. Just like it can be helpful to have a buddy to work out with, it can be helpful to have a buddy to keep you going on the days when you are having trouble remembering why you wanted to stop shopping and spending money. Suggested Reading: Want to learn more about ways to contain your spending and cost of living? Check out one of my favorite personal finance books, The Millionaire Next Door: The Surprising Secrets of America’s Wealthy (affiliate link). This awesome book uncovers dozens of secrets of wealthy individuals. Hint: Spending and cost of living are MAJOR factors contributing to their success!! Is emotional spending a problem you have ever dealt with? How did you manage your emotions? Do you use a self-imposed wait time before making certain purchases? I used to shop when I was bored, and that’s the closest I’ve ever gotten to emotional spending. We don’t really have that problem anymore. I hate shopping! “The desire for no worry or stress about finances makes it easy to never want to shop again” – LOVE this! You’re so right- now that we’ve sort of got our financial heads on straight we know that what we REALLY want is to not be so deep in debt and to not have to work for years and years more before achieving our dreams. My emotional spending used to be CRAZY! I remember one time, years ago, when our oldest was just a baby, I got mad at Rick and went out and bought her a new bedroom set. WTH? I would use any emotion as a reason to spend. Thankfully, now that I’ve solved some self-esteem issues, the problem is gone. For me, the best way to avoid emotional spending is to give myself “distractors” so that I don’t feel compelled to spend money. My usual suspects are exercising, Pinterest and writing. When I feel as though I am in a bad place and may spend, I usually start doing one of those things and I distract myself from the spending. Exercise is a biggie for me too. That’s become my new method of distraction/coping mechanism. Great post! I so agree with you on shopping with a list and waiting to buy! I actually prefer not to go into stores at all (am able to get most household items from Amazon), but when we do have to set foot in a bricks and mortar shop, the list is certainly a savior! Store are way too crafty at making you think you need any number of “necessities,” but if they’re not on your list, you didn’t need them before you came in. Mu husband and I actually wait to buy things for a very long time–months usually. I keep a list of things we think we “need” and we wait to see if we still “need” them several months later. More often than not, we’ve found a work-around with something we already own. Yay, another Amazon-everything shopper! I seriously buy nearly everything on Amazon. The only things I buy in stores now are groceries and things that would be too heavy or bulky to ship, like liquid laundry detergent or toilet paper. The added bonus is that I live in a state that does not have an Amazon distributor- so no sales tax for me!! There are a lot of similarities between emotional spending and emotional eating. I struggle with the later and often overspend at the grocery store. Yesterday, for example, I purchased WAY more than usual – organic pickles, local honey, etc. And I felt a strong sense of satisfaction putting all of my new food items away. I’ve been trying to identify where this comes from and find other things to replace it with. I know for me at least, I used to be an “emotional shopper” as a coping mechanism. Pretty much any perceived injustice or sadness in my life used to be a reason to go shopping! For me it was a matter of finding a better way of coping- usually exercise- to help alleviate the feelings. It also took a lot of serious reflection and me coming to a deep understanding that shopping was NOT going to fix my troubles. Great post, Dee! Personally, I try to always shop with a list and pay close attention to how I feel when I buy things. The list is a lifesaver for us, and we try to always make sure we have it written down and in hand- because sometimes it’s not enough to have that mental list of the 3-4 things you need. I definitely used to spend money out of boredom and laziness. A lot of my time spent with friends was spent shopping and I’d buy junk whether I needed it or even wanted it because everyone else was. When my computer crashed in college I just went out and bought another one because I didn’t feel like trying to fix the problem or taking it somewhere to have someone fix it. Luckily, I’ve come to hate shopping and hitting our savings goal every month feels 100 times better than anything I can buy. I hear you! My friends, although I love them dearly, also used to contribute to my spending problem since we would shop together. Luckily growing up and gaining more responsibilities, families, etc helped with this (and we have now moved and don’t see each other as often). My emotional spending used to be bad. I just didn’t care because I wanted something/anything to make me happy. So glad I got out of that trap. It’s a vicious cycle too because then you feel bad for spending. Thanks for the great tips. I think we have all been there at one time or another. The most important thing is that we’ve recognized it and are working to do better now! Great article! Emotional spending can really hurt you. Having a plan to avoid it all together works best for me, but everyone is different. I think it’s important to identify the WHYs of emotional spending and then work to put coping mechanisms in place. That’s what worked best for me anyway! My problem is emotional eating more than emotional spending, but I’ve been known to engage in retail therapy every now and again. What works for me is going thrift shopping. Sometimes, I find a huge bargain, and even if I don’t, the damage to the wallet is minimal. Goodwill is a lot safer than Nordstrom! Ha, great point about Goodwill vs. Nordstrom! And the great thing about thrift stores is that you can easily spend hours there strolling the racks because they have so much stuff. The last time I went to a thrift store I spent over an hour there and came out with an armload of baby clothing. Total wallet damage= $12. When I’m emotional down, the first thing that I really want to do is to go to the salon. For me, it can help me to release some stress but now I tried to control it.